Lust is one of the seven deadly sins, but fun nevertheless... When I found out that Loth-X had introduced an integrated amp around the legendary WE300b triode tube, and that it was the logical partner for my Loth-X Polaris horns, I began to get interested. Seeing pictures of the same and a few early reports had me salivating freely. So a bit of string pulling found a moderately small but very heavy box (22 kgs) dropped off at chez nous. Removing the Ji300 from its packing was as exciting and rewarding as I'd hoped. 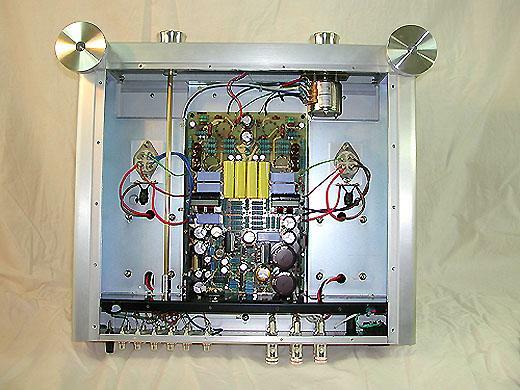 Valve amps by their very nature have an advantage in appearance over their transistor rivals, the glowing valves alone causing second glances, but many are appallingly styled, often a slab of aluminium or more fashionably wood, nailed to a rather prosaic powder coated steel box. The Ji300 is made up of a series of machined aluminium plates cut from solid. The fit and finish is as near perfect as makes no difference and the styling superb, solid, purposeful, architectural even, without resorting to the 'tinsel town' styling that so many are attracted to. The control knobs, two of them, are solid aluminium and give the impression of a bank-vault combination control - they feel that good to use too. Topping the design off is the complement of valves - the genuine GE300b's and two pairs of 5965 and 5687. There's no valve cover which is great from a visual point of view, but it amazes me in this safety obsessed world, where 4mm banana plugs are seen as potentially lethal, that a manufacturer can get away with exposing valves which if fallen on will kill. I make sure such amps are well away from kids, but how often have you seem such glowing delights on the floor at shows and emporiums? Of course this is a 'single-ended' design, purist and flavour of the month. Internal construction I'll not comment on as a) I'm ignorant, and b) unlike the 'box' I don't give a monkey what the guts are as long as they sound good and continue to sound good. The Loth-X site has the technical stuff so if you're interested go look there, it all sounds pretty impressive to me, silver wired output transformers and 400euro stepped attenuators don't come with your average amp :-) The important stuff is that it's a line-level integrated with 5 inputs including a tape loop. First a quick note on compatibility. Here the Ji300 was tested with its natural partner, the similarly priced Polaris. With an efficiency that would rarely draw more than a watt and a perfect load for the amp, a whole range of variables were removed. 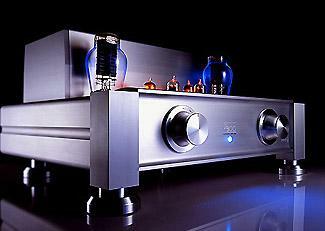 High-end amps, particularly SE amps, are fussy beasts but here the Ji300 was playing on 'home-ground'. It also had a superb front end of similar price, the Orbe/SME4/Dynavector DRT-1, feeding it, so the stage was set for something spectacular - though I suspect the similarly priced Loth-X Aida would be an even better match as its character is more complementary (but I'm getting ahead of myself). Overall, I've rarely been as excited when anticipating the first notes from a test component. I deliberately left the amp on for a day before listening, I didn't want my first impression to be tainted by a cold amp. On that subject, the mains switch is hidden round the back - this is an amp meant to be kept running, and before you begin to worry at the effect of this on the life of those expensive 300b's, remember it's the shock of switching on and off (expansion and contraction) that does most damage, just like a light bulb usually goes 'pop' when it's switched on. Continuing the obsession with getting that good 'first impression' I had the phono stage permanently on (the Black-Cube SE at that time), and finally I ran the stylus for two sides of an LP before finally clicking that chunky input selector to the appropriate position and dropping the needle onto my most precious record - Sheffield labs direct-cut of 'King James'. Spectacular? Oh yes :-) SE amps are all about midrange clarity and here the effect was absolutely astonishing with the atmosphere and space in that chapel venue thrown out at you. A huge soundstage and a level of detail, not just the odd bit here and there, but a whole new layer clearly audible. Extra members of the brass section, the difference in the 'hands' on the piano, the definition in the bass and it's position in space - breathtaking. But the balance had altered significantly from my Audion amps. Not only was the midrange transparent, it was also prominent, the warmth and bass weight of the Audions missing, the body on cymbals and cornet reduced. So the Ji300 was special, but it wasn't going to be an easy 'slot-in' to my system. The first thing was to do the obvious and move the Polaris back towards the back wall, this lifted the bass and added a little of the missing warmth. I tried some Sonic Link Horizon speaker cable but it proved ghastly - harsh and congested (it had worked well with my IPL's), the Origin solid core (better), before going back to my old favourite, TNT's FFRC. I played with various interconnects, eventually settling for the Audionote silvers, but at this level something more fundamental needed to be optimised. Luckily I had 4 phono stages to play with and eventually settled for the Graham Slee Era Gold/Elevator (see review for details) a surprise given its price but a pleasant one nevertheless. "No speaker has showed such a difference between a warm CD player and a cold one, ditto for cartridges where I had to play a side of music before the XV-1 came on song. But here you can't blame the Polaris for telling the truth. It also made me very careful over cabling and revealed more than ever how Sunday nights electricity had magic rather than rubbish in it." Now substitute "amplifier" for "speaker" and "Ji300" for "Polaris" and you have the nub of the matter. Adding two such transparent components merely increases the microscopic examination that every recording is put through. Putting on the CD of the Pretenders 'Last of the Independents' (buy it...) a superb CD but a rather forward glassy mix, I revelled in the extraordinary space and acoustic but had to take it off before the end. Madonna's 'Like a Prayer', a recording I'd considered pretty good mainstream pop, sounded harsh, compressed and edgy. Detail was incredible, nothing missed, but I just couldn't relax, or more importantly, loose myself in the record. The lack of bass warmth and weight left such recordings 'stripped bare'. Brubecks 'Time Out' went on, and straight away, there were the hallmarks of a great recording, the space, the sound of the studio, the detail. Putting on the Naim CD of Ken Saratoga's 'Rebel Souls' was awesome, once again the same story - space, atmosphere, detail, speed. The magic returned. And by now I was starting to get ever so slightly depressed. Rather than sitting in front of glorious music, I was sitting in front of a system poised like the executioners axe, over every disc, either vinyl or CD placed before it. Records I considered OK but not great often sounded unlistenable, especially if they were inclined to brightness, the ravages of compression as applied to modern pop and rock was heartbreaking. But this savaging of poor recordings or performances runs to the classical field too (yes I do have some classical records - about 300). For example I have two copies of Holst's 'The Planets'. I like both, they sound pretty good and hey! It's a cool piece of music if a little 'over-exposed' nowadays. One copy is the Halle conducted by James Loughran in1975. Bloody horrible - compressed, edgy, very little warmth and a 'funnelled down the middle' soundstage. Putting on my other copy, Bernard Hermann conducting the LPO in 1970 sounded much fuller, warmer and bigger. The recording engineer obviously had a much better idea what he was doing, unfortunately Hermann didn't and it was a turgid plodding performance, 'Mars' sounding like a funeral march on a wet Sunday afternoon rather than sound of oncoming jackboots. So I'll have to start a search for a better, perhaps the best copy - how many LP's will I have to buy before I have one that does the combination of Ji300 and Polaris justice? And inevitably, my preferred musical period and taste - 60's, 70's 80's rock suffers worse. Sure Dire Straits sounds amazing, Sting's fiddling with fake 'atmosphere' interesting, Led Zep's output captivating, 'Dark side of the Moon' spine tingling, but given the system as it stands 'Pet Sounds' would stay in the kennel, 'Let it Bleed' untouched, Chuck Berry 'unspun' and what a tragedy that would be. At the end of the review I plugged my old Audions in and with almost a sense of relief put on some of my neglected 'classics'. I managed to relax and loose myself in the records and stopped worrying about the performance. Listening to my 'show-off' recordings made me cruelly conscious of the 'editing' that was going on, but it's something I have to live with. The Ji300, especially when combined with some of the most revealing speakers out there, is just too good for the majority of my own record collection. For a connoisseur who is prepared to look for the best performance of classical works, old 60's Deccas, Red Labels, FFRR's, whatever, then the Ji300 will drag the very last ounce of fidelity from them. Ditto those blessed with some of those wondeful jazz and blues recording from the 'golden age' (you should have heard Nina Simone). But here the Ji300 was at its best when I had visitors to impress and I pulled out treasured 'hi-fidelity' recordings. Everyone was awe struck, but 2 minutes of anything less that 90% 'perfect' had them wanting to move on to something else. For my record collection the Audions were just much more forgiving - that they were less detailed, slower, less open, more coloured and after the Ji300, just plain boring, doesn't alter the fact.